I am so happy to be singing for this wonderful Foundation that wants to bring attention to the Opera in a fabulous area rich with opera lovers and hungry for music. They loved the concert so much in New York and they wanted to know if I would help them bring attention to these wonderful Charities and this fabulous area for those who love the Arts. They have no formal theater in the area so they are using the brand newly designed auditorium Cape Henlopen High School Auditorium in Lewes, Delaware, a state of the art facility- I must say- and I will feel like an operatic episode of the Hit TV Show GLEE- a fabulous place to perform….. helping to plant a seed for the opera. I am excited to help them and I get to get my stage legs back in prep for a major opportunity in the early December period. More on that to follow. 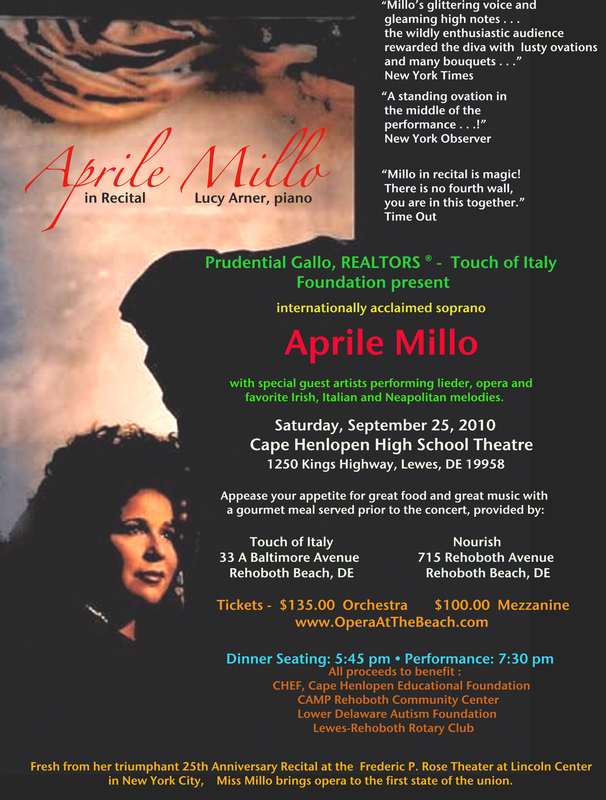 Meanwhile, Prudential Gallo REALTORS with Touch of Italy are tipping their hats to the fabulous Martini and Rossi concerts in the Fifties that featured great singers singing followed by a great feast, if you are in the area, come by and join me….. it should be great fun. Go to http://www.OperaAtTheBeach.com for more details…. ~ by aprilemillo on July 16, 2010.